Prominent & Leading Exporter from Mumbai, we offer vespa sxl 125 scooty, vespa vxl 125 scooty, vespa vxl 150 scooty and vespa sxl 150 scooty. We offer Vespa SXL 125 Scooty. Spark Timing Management with Power 11.6 PS © 7000 RPM Max Torque 11.5 Nm © 5500 RPM. Also available in 125cc Engine, 3 Valve, Aluminium Cylinder Head, Overhead Cam and Roller Rocker Arm. MAP Sensing and Variable Spark Timing Management with Power 10.06 PS © 7500 RPM Max Torque 10.6 Nm © 6000 RPM." Body Construction :Monocoque Full - Steel Body Construction. Overall Dimensions (UMW - 1770 x 690 x 1140. Suspension : Aircraft derived single side arm Front Suspension with Anti-Dive characteristics. Rear suspension with Dual-Effect Hydraulic Shock Absorber. Electricals : 3 - Phase Electrical System and auto ignition. Brakes : Disc Brake: 200 mm Ventilated Front Disc Brake and 140 mm Rear Drum Brake diameter. Tyres : Tubeless Tyres. Broader tyres: Front tyre size 110-70/11 and rear front tyre size 120-70/10"
Stability : Link spring mechanism between engine and frame provide amazing balance by balancing of mechanical trail and the stabilizing torque which offers low speed balance, accurate steering and high speed stability. 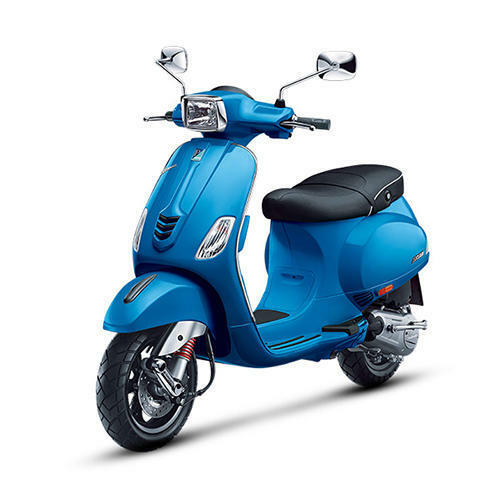 We offer Vespa VXL 125 Scooty. Body Construction Monocoque Full - Steel Body Construction. Overall Dimensions (UMW - 1770 x 690 x 1140. Suspension:Aircraft derived single side arm Front Suspension with Anti-Dive characteristics. Rear suspension with Dual-Effect Hydraulic Shock Absorber. Brakes: Disc Brake: 200 mm Ventilated Front Disc Brake and 140 mm Rear Drum Brake diameter. Tyres :Tubeless Tyres. Broader tyres: Front tyre size 110-70/11 and rear front tyre size 120-70/10"
stabilizing torque which offers low speed balance, accurate steering and high speed stability. 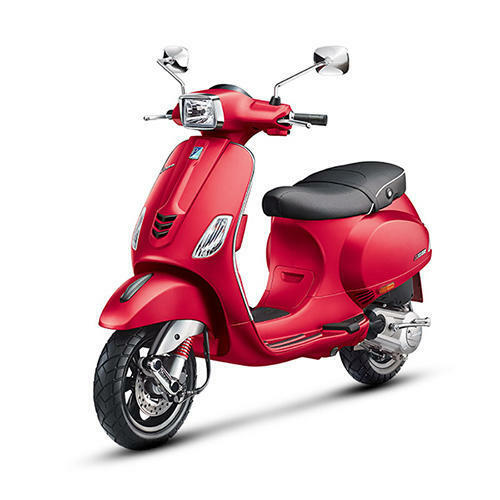 We offer Vespa Vxl 150 Scooty. Engine :150 cc Engine. 3 Valve, Aluminium Cylinder Head, Overhead Cam and Roller Rocker Arm, MAP Sensing and Variable Spark Timing Management with Power 11.6 PS © 7000 RPM Max Torque 11.5 Nm © 5500 RPM. Also available in 125cc Engine, 3 Valve, Aluminium Cylinder Head, Overhead Cam and Roller Rocker Arm. MAP Sensing and Variable Spark Timing Management with Power 10.06 PS © 7500 RPM Max Torque :10.6 Nm © 6000 RPM." Body Construction :Monocoque Full - Steel Body Construction. Overall Dimensions: (UMW - 1770 x 690 x 1140. Aircraft derived single side arm Front Suspension with Anti-Dive characteristics. Rear suspension with Dual-Effect Hydraulic Shock Absorber. 3 - Phase Electrical System and auto ignition. Disc Brake: 200 mm Ventilated Front Disc Brake and 140 mm Rear Drum Brake diameter. Tubeless Tyres: Broader tyres: Front tyre size 110-70/11 and rear front tyre size 120-70/10"
Link spring mechanism between engine and frame provide amazing balance by balancing of mechanical trail and the stabilizing torque which offers low speed balance, accurate steering and high speed stability. 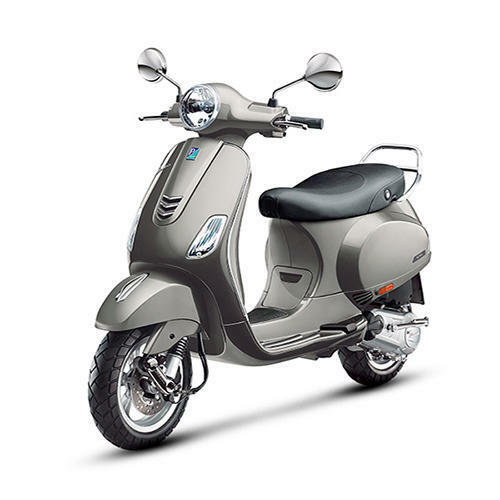 We offer Vespa SXL 150 Scooty. Engine:150 cc Engine. 3 Valve, Aluminium Cylinder Head, Overhead Cam and Roller Rocker Arm, MAP Sensing and Variable Spark Timing Management with Power 11.6 PS © 7000 RPM Max Torque 11.5 Nm © 5500 RPM. Transmission : Continuous Variable Transmission. Brakes Disc Brake: 200 mm Ventilated Front Disc Brake and 140 mm Rear Drum Brake diameter. Tyres Tubeless Tyres. Broader tyres: Front tyre size 110-70/11 and rear front tyre size 120-70/10"
Stability:Link spring mechanism between engine and frame provide amazing balance by balancing of mechanical trail and the stabilizing torque which offers low speed balance, accurate steering and high speed stability.